Relax and feel restored with this Yoga For Relaxation course. 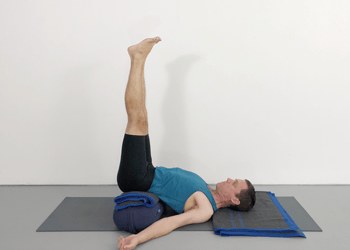 Prioritise your health and wellbeing as you are guided through a range of complementary restorative Iyengar yoga sequences that will soothe your nervous system. These lessons focus on supporting you so that you can learn to relax and let go of tension in your body and your mind. With regular practice, restorative yoga can be a powerful tool for reducing stress. It also helps you to rebalance during times when you are feeling lower in energy and needing to rejuvenate. The classes in this course are of varying length so that you can easily fit a lesson into a busy schedule, or spend more time on your self-care when you have an opportunity. You will learn how to correctly use props to support your body in a range of rejuvenating positions. Supported chest opening in particular will assist your focus on breath awareness and feelings of relaxation. Ideally, some prior experience with Iyengar yoga is desirable prior to commencing this course (for example, completion of the Yoga Selection Beginners Program or something similar).